Are you not aware of Indian History Topic? Then go throughout this page, by practicing and attempting this Indian History Quiz you will get an idea about our Indian History. So, people who are much more interested in learning about Indian History can have a glance here and take the Indian History Online Test. And practicing this Indian History Quiz GK Questions. Moreover, when aspirants like to attempt any sought of GK competition exams like General Knowledge or Current Affairs, we recommend people to try and practice this MCQ test. As much as they can boost you in improving your knowledge and socio skills. While performing any Gk test, people used to say that, they are not good in Indian History, so for those people, this Indian History Online Test will assist you to overcome that unawareness. Therefore, get the Indian History GK Questions and Answers from below. 1.4 Why Learn Indian History? 1. Where did British first open their factories in Eastern part of India? 3. To perform which among the following functions, Rajukas were appointed by Asoka? 5. Which among the following is not a correct pair? 7. Which of these battles proved decisive in the Anglo-French rivalry in India? 8. Which of the following is correct? A. "The First War of Independence : 1857"
9. Who established the Mughal Dynasty? 10. Who among the following introduced the subsidiary alliance system in India? 11. Which of the following sites is famous for stupas, monasteries, temples and pillars? 14. Which Indian king did the ancient Greeks refer to as Sandrocottas? 16. Who is the founder of Haryanka Dynasty? 19. During the colonial rule in India, the Permanent Settlement was introduced by? 20. Who among the following, was in charge of land revenue system during the reign of Akbar? 21. Which Indian State is earlier known as “Magadha”? 22. In 305 BC selucus Nicator attack India. At that time who was the emperor of India? 23. Who is the last Tirthankara (Jainism)? 24. Who is the establisher of Sikh religion? As we all know that our nation is an ancient civilization culture, the home of many civilizations. By introducing INDUS VALLEY CIVILIZATION and the arrival of ARYANS – considered as the pre-Vedic and Vedic age, their Indian history came into the picture. The period of Indus Valley Civilization is thrived in the north-western part of the subcontinent from 3300 to 1300 BCE, which has a prosper economic system. 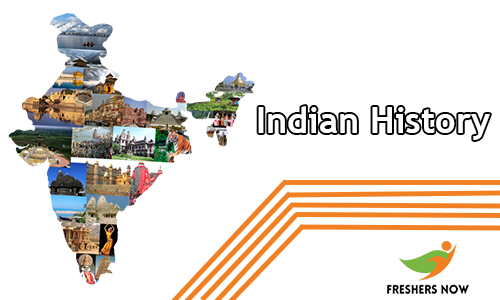 People who are interested in taking the Indian History Quiz can hurry up and utilize this opportunity by taking the Indian History Online Test. So, the people of this civilization utilized agriculture, domesticated animals and the preparation of weapons from different varieties of metals like iron, copper, bronze etc. And those are used for the purpose of the Middle East Countries. As we all know that we are under the rule of many Kingdoms and Emperors in the past periods. Moreover, within the beginning of the urban civilization in our subcontinent, Mature Indus Valley period spread between 2600 to 1900 BC. This was flourished between 2800 and 1800 BC, which has a well advanced economic system. Within the urbanization, many urban centers were raised in North India in the period of Vedic age and the predominant occupation of the people resided in villages is Agriculture. Our ancient India has traded with Middle East Countries, North India, Roman Empire and South East Asia. In return for gold and other metal like silver, products like calicos of Bengal, shawls of Kashmir etc. And also many agricultural products like pepper, opium, and indigo are being exported to Europe, Middle East, and South East Asia. Well, interested in taking the Indian History Quiz? Then cool down and take a look at the above given Quiz. Moreover, at first, all the participants need to click on the Start Quiz link. And then start answering the Indian History Quiz GK Questions. Apart from this, you can also check the Indian History Quiz Questions and Answers. Although, after completion of the Indian History Quiz Online Test, check your answers with a clear explanation. Moreover, we are always here to help the candidates in providing the valuable details. Therefore, bookmark this page and take the Quiz at any time. Hence, take a brief look at the above section. It was a long period of our subcontinent’s history is in between “Ancient India” and “Modern India”, this period was initiated to be the slow collapse of the Gupta Empire from about 480 to 500 in the ending of the classical period as well as Ancient India. The simple and best answer to this question is, no one can move forward without getting the knowledge of the past. So, try to learn about the Indian History. Focusing on the people at that time with a proper timer. Our Indian culture, traditions and customs, Food, Leadership, Trade are covered for every quiz practiced. Giving confidence to the individual to solves their competitive exams. As mentioned earlier the result of the Indian History Quiz is given after the submission is done. Moreover, the result format is it contains the number of questions attempted, marks, points and grades along with an appropriate explanation. And it gives the correct answer of the aspirant for each and every question. Finally, by attempting this Indian History Online Test, we can easily solve their competitive examinations. So, visit our website Freshers Now constantly.